Velsa is a Dunmer found in Abah's Landing. 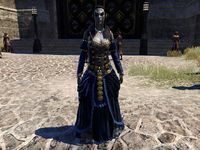 She had previously retired from the Thieves Guild, but was invited back by the current Guildmaster Zeira. After you have made your way through her traps, you can overhear her talking to Silver-Claw in her garden. Velsa: "Did you fall and land directly upon your skull? I … am … retired!" Silver-Claw: "Velsa! Do not make me beg. It is unbecoming of our most profitable history." Velsa: "And who is this, Silver-Claw? Who else befouls my garden?" Silver-Claw: "In all truthfulness, I have no knowledge. A friend? But … you have no friends. Beyond my humble and mercantile self, of course!" You can then talk to her and present her with proof that the Iron Wheel is planning to arrest her. "You made it past my traps. You're lucky, stupid, or quite skilled. I haven't decided which. Well? My garden needs tending. Out with it, and be on your way." I have a warning from the Thieves Guild. "What Thieves Guild? The Iron Wheel killed or branded the lot of them! Did your illustrious guildmaster send you? Tell Nicolas if he shows his face here, I'd have a mind to slap it. With a switch. Covered in nettles." Nicolas is dead. Zeira is the new guildmaster. So "Guildmaster Zeira" sends a warning, does she? Nicolas barely in the gound, and she seeks to uproot my retirement?" She wants you to come to the Thieves Den. The Iron Wheel plans to arrest you. Here, we found this message. "The old cistern? Zeira wouldn't warn me unless she wanted something. And I would like to see the quality of recruit she allows into her "Thieves Den." Very well. Help me repay a favor and I'll play Zeira's vastly inferior game. This is where you agree." "Ah, you showed interest. I'll consider that your agreement. The skittish Khajiit pretending not to eavesdrop is Silver-Claw. Ask him why he needs our help. Meet me behind his old warehouse—after you know what you're walking into." After talking with Silver-Claw, you can meet Velsa outside the warehouse after making your way through the district. "You're here, and relatively unskewered. Next is the significantly harder part. First, we sneak into the warehouse. Next, we observe our surroundings. Finally, and this is the most important part, you do exactly what I tell you to do." "You didn't bother to ask Silver-Claw? Sharp as a barrel bottom, you are. Silver-Claw wants us to recover his ledger. Like a book—have you seen those before? Squiggly lines, sometimes pictures, about as thick as your skull?" [Intimidate] Keep talking, and your skull will be flat as a book. "No wonder Zeira brought you into her Thieves Guild. She mistook the muscle in your head for wit. But there's more to you than that, isn't there? We could keep flexing all day, but there's a ledger to steal. Are you ready?" "Dancing girls and animal acts. It's a warehouse! Sweaty laborers and rough-hewn crates. What do you expect." "Good, you can take direction. Did he tell you it's packed with dirt on merchants throughout Abah's landing? How will Zeira react when I bring her a grateful Silver-Claw and his insidious ledger? I do hope it makes her eye twitch." All responses will eventually lead to Velsa heading into the warehouse. Velsa: "Follow me, and keep quiet!" When you enter the building, you can find her observing one of the overseers. "Hmph. A fool braying orders to lackeys." Up on that platform? I see him. "I meant "Guildmaster Zeira," but yes. We'll need to get past that overseer to reach Silver-Claw's old office." "First you'll wait for me to get into position. Then you'll distract him so I can knock him on the head. Here, take this stink apple." Stink apple? What's a stink apple? "An alchemically infused apple. Throw it hard enough and it breaks open—surrounding your enemy with a rancid bouquet of boiled netch farts. Once we've dealt with the overseer, what next? "Make your way past the guards. Silver-Claw hid the ledger in his old office—we'll meet there. Now. Wait until I'm in position, then throw the stink apple." You can then distract the overseer Torkming. Torkming: "Lift with your legs! Not your back, you fool!" Torkming: "What the …. Shor's bones, the stench!" Velsa: "This way … hurry!" Once you reach the upper platforms to the door outside, she will call you over. Velsa: "Over here! Quickly, before we're seen!" If you talk with her at this point, she will merely say, "I'll keep watch. Find the ledger, then we can leave." After you find the hidden ledger, you will need to hide quickly. Iszreena: "You see? No one here. Trying to cover up for your nap?" Torkming: "Torkming is ever vigilant! There is an intruder in this warehouse!" Iszreena: "Cosh's people are on their way to inspect the warehouse. We don't have time for this nonsense!" Torkming: "An explosion? Torkming knew something was amiss!" Velsa: "Surprise, you fools. I'll collect Silver-Claw—meet us back at the Thieves Den." Once you arrive at the Den, Velsa will be sitting outside. "I'll speak with Zeira when I'm damned well ready. Best to let her stew on what I've done." The overseer mentioned someone coming to inspect the warehouse. "Cosh" was it? Must be a new player. Hadn't heard the name before I retired." Any theories about what this Cosh wants with Silver-Claw's warehouse? "It always comes to coin with the Abah's Landing merchant lords. Consolidate the competition, lock them in a set of gilded chains, then profit. But not that warehouse. My distraction made it … undesirable." What exactly was your "distraction?" "My own concoction. When poured into a crate filled with sawdust, the crate emits a thick smoke, Any reasonable person would reach for a bucket of water to douse what appears to be oncoming flame. Yet it reacts quite poorly to water." "The deafening bang is the least of it. The smoke increases tenfold, mimicking the mating odors of the female dragon frog. Every male dragon frog in the city should fill the warehouse by sunrise. Hope they confuse Cosh's shoe for a mate." Once you have spoken with Zeira and received your reward, Velsa will arrive and you can witness their heartwarming reunion. Velsa: "You could practice thinking with your mouth closed." Zeira: "Oh joy. Here she is." Zeira: "Velsa! I'd recognize your grating voice anywhere. How is your retirement? Seems there are some troubles from which you can't run away." Velsa: "It's very relaxing, "guildmaster." Did you know I named a weed after you? It grows taller than it should, and take more water than its share from the plants around it." Zeira: "That's hard to believe. You were never the type of person to get your hands dirty." Velsa: "Oh, it's true! The danizeria weed thrives in the dark. I take great pleasure in cutting it down to size, every day." Zeira: "Just as I remember her." Velsa will have gone to the No Shira Citadel and be found in the camp outside. "So, you got Silver-Claw to spill a secret. At best, a minor accomplishment. He didn't send you to that powdered hornbill, did he? "Buy a special uniform to fit in?"" "You do know he gets a referral for everyone he sends to that flax-peddler? Even when he thinks my life is in danger, Silver-Claw still works the angles. [Persuade] Before, you told me to always know what I was getting into. You're not supposed to throw my words back at me. Reminds me of Nicolas." Velsa, what are you doing here? "I don't care if you are her protege, I'm not going to do Zeira's scutwork. I slipped a truth serum to Silver-Claw's former overseer. I learned that Cosh blackmails assorted scum and draws them to No Shira Citadel for a meeting. So let's find out why." All right. What do we know about him? "It seems Cosh contacts little fish from a position of power, threatens exposure, and bends them to his will. Elegant—what I'd do. But his connection to the Iron Wheel isn't clear. That troubles me." ""We?" Now that Zeira's protege is here, poor old Velsa can rest her weary bones. Find a way into the Iron Wheel's headquarters and learn how they're connected to Cosh. Oh, and blackmail needs documents—be sure to swipe them." You want me to break into the Iron Wheel's headquarters? "Zeira tells me you're a thief! Go break into a place you shouldn't be, take something valuable, and leave before they notice. I did hear something about a pass-phrase for a "service door." Look around, use your brain. I won't spoon feed you." You can ask her some more questions before you head into the Citadel. "When you find what you need, get out and head back to the Den. Don't get caught—and if you do, bite off your tongue before their torture forces you to shriek my name. You'll be fine." What task did Zeira give you? And everything led here, didn't it? If we leave, we miss this opportunity to learn Cosh's plans." Once you have taken Cosh's documents and escaped the Citadel, you can enter the Den and find Velsa with the others ranged around the main table. Velsa: "You see, Zeira? Your protege returns, having survived the "invulnerable" Iron Wheel. You should have more faith." Zeira: "Everyone, clear the room." After infiltrating the No Shira Citadel, Velsa will leave you a note on the Heist Board which asks you to find her outside the Den. She can be found sitting at a campfire outside. "You've been busy. Did you realize you've provided the Thieves Guild with a lucrative opportunity? Probably not. It's all right, I won't even imply you're thick. That's how lucrative." You'll have to be specific. "Silver-Claw's ledger? The blackmail you stole from No Shira Citadel? This is our blueprint to pulling heists, just like we used to. We can hit our rivals where it hurts. Take their ill-gotten gains for ourselves. Use it to rebuild." "Among the blackmail, I noticed the name Fa'ren-dar. He's a "claw-cutter"—a thief who robs other thieves. Wouldn't you know? He's signed on as our master of heists. Now, and don't strain yourself … who should you speak with next?" "Fa'ren-dar likes to soak in the city. Gathering information, he calls it. I think the only thing he's soaking in is cheap swill, but he gets the job done. He's expecting you." After receiving her note, you can find Velsa in her garden. She was recently contacted out of the blue and it worries her, so much so that she is reluctantly asking for help. "Took your time, didn't you? I got your note. You wanted to talk to me? "I … I need your help. I was in the market when someone slipped me a letter. It might not mean anything, but on the other hand, it might be some sort of trap." Tell me more about this letter you received. "A folded sheet of paper, unsigned. It was only a few lines, wishing me well. But when I unfolded the sheet, an old, pressed stargazer peony fell out. That … that unsettled me." "It's a flower. Others just like it blossomed all around my family home. But I left my family behind a long time ago. If this is their way of sending me a message, I need to know why now after all these years." You want me to find out who sent the letter and why? "You've consistently demonstrated a lack of incompetence. Find out if my family sent that letter. I didn't part on the best of terms, so it could be a trap. But they won't expect you, which means it shall be slow to spring." You must have some notion of what this is all about. "Decades ago, I was Velsa Arendis of House Dres. Yes, the one built on the spoils of the slave trade. When I fled, I released dozens of slaves. Gave them gold from the house treasury. I regret not seeing the look on Mother's face. But nothing else." You didn't see the person who slipped you the letter? "Yes, but I didn't realize it then. I was taking a merchant to task for her prices when a half-naked Nord bumped into me. That's when it happened. He fled before I could give him a piece of my mind, toward the merchant camp outside the city gates." "No one in the guild knows I hail from House Dres. Keep it to yourself, and don't you dare tell Zeira. The letter is over there, if you wish to examine it." Once you have read the letter, you can leave her Villa and continue your investigation. After some traveling, you can return with Narahni in tow. You can then witness their reunion. Velsa: "Did you find out who sent that letter? Not that I was overly concerned …." Narahni: "Someone who lacked the courage to sign their name, but now wants to make amends." Velsa: "Narahni! Is it really you? Just the sight of you opens old wounds …." Narahni: "Oh Velsa. I know what you saw, what you must have thought. This one never meant to hurt you." Velsa: "I saw you in my brother's arms! He was the worst of my family! How could you?" Narahni: "He arrived at exactly the wrong moment. I had to do something or our entire plan would have failed." Velsa: "You … you didn't betray us? You … did that for … me?" Narahni: "It was the only way to guarantee your escape." Velsa: "I let the years flow by without giving you a chance to explain. What a waste! But I'll make it up to you. I'll keep you safe." When you talk with Velsa, she will be the happiest you've seen her. "Is this what happiness feels like? Yes, I suppose it is." You seem glad to see Narahni again. "I had no idea this would be the result of sending you to find a half-naked Nord. The last time I saw Narahni was quite unpleasant. There was poison in that wound. I don't think it ever truly healed." You weren't an easy person to get along with, that's for sure. "You reunited me with my one true love, so I choose to ignore that. I hope there's time to share a few lasting moments before all is said and done." You both have a lot of catching up to do. "All these wasted years, we've missed out on so much. Narahni wears them like a cloak—though with grace and style. I am … grateful … you convinced her to come here." After you talk with Velsa, she will lead Narahni to a chair. Velsa: "Narahni, you must be tired after the journey. Relax and we'll talk later. I know we have so much to tell each other." When you arrive at the den, Zeira will have gathered the others. Velsa: "Back to the tomb? Your plan is to relive the guild's greatest failure?" Zeira: "My plan is to get the Iron Wheel's boot off our necks!" If you talk with Velsa, she will give her opinion on Zeira's plan. "Have you heard Zeira's plan to kill off her own Thieves Guild? Go on, ask her. I'll wait." After you hear Zeira's plan, the others will head off to their tasks. Quen: "Off to find Percius Loche. Meet you there, partner." Zeira: "Everyone else, pack for a long journey. I'll bring us home safe and sound." Velsa: "More promises you can't keep." You can meet Velsa again with the others at rendezvous point in front of the Prince's Gate. "If three of us survive, we'll be a greater success than the previous failed attempt. After you head into the kingdom of Taneth and to the al-Danobia Tomb, you will find that the Iron Wheel is guarding it. Velsa will give you some advice. "See how the Iron Wheel litters their camp with traps? Or perhaps you don't. Try not to die out there." 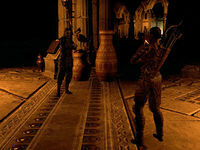 When you enter the tomb and reach the Tuwhacca's Pillars chamber from either direction, your thief companions will enter the Tomb and start looking around. (?) "An imposing door. Wonderful." Quen: "How are we supposed to get through?" Velsa: "Ask Zeira. She knows how to do everything in this place, unless it's stealing a dowry." Zeira: "No idea. Last time, Nicolas had me watch the passage behind us. There must be something in his journal." Zeira: "Nicolas loved his puzzles. You're welcome to try." If you talk with her, she will not give any thoughts towards solving the puzzle. "Don't look at me, I hate puzzles. Once someone knows the answer, everyone knows the answer. Once you open the door, the group will head into the chamber known as Shinji's Truth. Zeira: "The journal says this chasm is called "Shinji's Truth." Last time, we never made it across." Quen: "I can't see the bottom. Is there a bottom?" Velsa: "Throw yourself in. We'll see how long before we hear the splat." Zeira: "Quen, Walks-Softly—look for hidden doors or switches. Velsa, you're with me. I need your help to walk Malooc's Path." Velsa: "And what of your protege?" Zeira: "Watching my back, should anyone try to stab it. Let's go." Velsa and Zeira will then head into the unnaturally dark Malooc's Path. When you enter, Zeira will be looking over into the darkness. Zeira: "Forgive me, my old friends." Velsa: "What did you say?" Zeira: "Nothing. Velsa, do you see that panel? Put your hand on it until I say otherwise." Zeira: "When I set foot on Malooc's Path, an aura of light will surround me. The darkness cannot harm us as long as you touch the panel." Velsa: "So … what can harm you?" Zeira: "We could fall to our deaths. Or the creatures within could devour us." Velsa: "Well, then. Enjoy yourselves." Zeira: "Velsa knows what to do. But we should speak before we cross." If you talk to Velsa, she will point out the obvious. "Leave me be. I have to keep my hand on a panel." While you a Zeira navigate the path, Velsa will occasionally call out to Zeira—mostly to be sarcastic. Velsa: "Are you there yet?" Zeira: "We're still moving! Keep holding the panel!" Velsa: "Zeira? My arm's getting tired!" Zeira: "Don't you dare release that panel!" Velsa: "Zeira! One of the statues gave me a funny look!" Once you have collected the Ashes and found what appears to be Nicolas' lamp, you can return to the other of Malooch's Path through a side passage. Once there, Velsa will begin to lambast Zeira with no trace of the humor from before. Velsa realized what Zeira did during the disastrous heist. Zeira: "Velsa? You can let go of the panel." Velsa: "I know what you did"
Velsa: "I know how they died. How you killed them." Zeira: "That's low, Velsa. Even for you." Velsa: "Always had to be the hero. Be the guildmaster's darling." Zeira: "You're cracked. I didn't need anyone's approval." Velsa: "You held the panel. From here you saw the creatures, closing in. You thought you could save them. Only you." Velsa: "So you released the panel. Grabbed your weapon. Rushed out to meet them." Zeira: "I could have saved them!" Velsa: "Because in your head, you are the hero." Velsa: "But the light faded. The darkness rushed in, and ate them alive." Zeira: "I tried to reach them!" Velsa: "And the darkness tried to eat you alive. So you had to recover from your wounds. That's why you didn't return to Abah's Landing—at least, not soon enough." Zeira: "I crawled from the tomb. The darkness … you can't imagine the pain …." Velsa: "You were the only one who could have warned the guild. Who could tell them the Iron Wheel was coming." Velsa: "Zeira … you were never the hero—you were always a thief. Now?" Velsa: "You're just a shadow." With no more words between them, the three of you will head back to Shinji's Truth, only to find Quen apparently standing on thin air. Walks-Softly: "Quen, it's a bad idea." Zeira: "Someone, tell me what I'm seeing." Walks-Softly: "We heard strange noises in the chasm. Stone grinding against stone. Quen, well …." Quen: "I found this invisible bridge!" Velsa: "So you followed my advice and threw yourself in the chasm." Zeira: "The ashes! Spread them on the bridge to see where it leads. And Quen, get back from there." If you talk to Quen she will say, "Of all the times to take my advice, she decides to do so now." After you create and path and clear the way, everyone will catch up with you once you enter the al-Dabobia crypt. Just in time to meet the next obstacle. Zeira: "The door to the treasure vaults, just through this crypt. We made it." Quen: "Do all crypts come with … whatever that is?" Velsa: ""Every tomb needs a guardian." An old Yokudan saying, wasn't it?" Lakayd the Repentant: "Your introduction is formless and without grace. Recite Danobia's maxim!" Zeira: "Velsa, Quen, Walks-Softly—stay back! If it's hostile, we'll handle it." Lakayd the Repentant: "Recite Danobia's maxim, or you shall be deemed trespassers!" Zeira: "It must be some kind of pass-phrase! If you have any ideas, now's the time to call them out!" Velsa: "You can't seriously expect us to—"
Walks-Softly: "Velsa, you aren't even trying." Lakayd the Repentant: "Trespasser! Danobia's justice falls upon you!" After you and Zeira deal with the Mournful Aegis, Velsa and Zeira will have a brief exchange. Zeira: "That didn't go as planned." Velsa: "You're right. I honestly thought it would kill us all." Zeira: "Come one. Let's see what's in the treasure vaults." Once you enter the vaults you will find that someone has already emptied them. Velsa will point out something is wrong. "We barely made it here alive, yet someone else slipped past the crypt's guardian? When you find a half-map on the ground, Velsa will come and look at it. Velsa: "Let me see that." Velsa: "Nicolas used half-maps like this—thin overlays placed atop existing maps. You line them up with common points of reference." After you present your findings to Zeira, she will believe that Nicolas faked his death at the very least. Velsa can only say, "Zeira should have known. She should have seen it." After learning about Zeira's plan for the upcoming wedding between Cosh and Magnifica Falorah, Velsa can be found in Silver-Claw's store. She will be in two minds about the plan. "I heard Zeira's plan. It's terrible, of course. But we'll get to ruin a wedding." When you have spoken with Silver-Claw, Velsa will comment on his penmanship. Velsa: "How can we expect a decent forgery? I can barely read your writing." Silver-Claw: "That is intentional. I write defensively! It keeps prying eyes from deciphering my ledger." If you talk to her before leaving the store, "I'll meet you at the Den. Or not. I don't think I'll risk my life on Zeira's behalf." Once you have returned to the Den with an invitation, you can overhear the tail end of a discussion. Zeira: "Velsa, for the third time—I hear your concerns." Velsa: "And ignore them at your peril." Walks-Softly: "Well, I'm in. A wedding at Hubalajad Palace? Just imagine the spread!" "I have to give her credit. Of all Zeira's bad ideas, her plan to crash the wedding is the most spectacular." After you have given Silver-Claw the invitation, you will need to pick a date for the wedding. Velsa is one of these choices, she will need some convincing. Why are you looking at me like that?" Do you want to be my date to the wedding? You're right, I was only joking. "The lesser soulgem of wit strikes again. Are you done wasting everyone's time? Go on, choose someone so we can get this over with." I'm very serious. I want you to be my date to the wedding. Never mind, I was only joking. You knew Nicolas as well as Zeira. You're the best choice to find and capture him. "Well. It seems you do have some sense in your head. The wine will help get me through this. As long as it isn't the same slop from the Senche and Serpent." You're important to me, Velsa. If you pick someone else, she will bid you farewell. "We'll await your return from the palace. Once you have selected an outfit, Velsa will be waiting for you at the palace gates. After attending the wedding, discovering the truth and escaping the palace you can return to the Den to find the others in a morose and demoralized mood. Velsa: "That could have gone better." Quen: "The Iron Wheel has Zeira. Aren't we going to do something?" Silver-Claw: "Not until we know where they have her. But we will, I promise you that." If you talk to Velsa she will bitterly say, "Foolishness, from the start. So stubborn. If she'd listened, she wouldn't be in this mess." Once you have spoken with Walks-Softly, Velsa will bluntly say it was Zeira's fault for getting captured—though she is despondent. "Zeira playing the hero again? I always told her she'd get herself caught or killed. I won't lose any sleep over this." Once Thrag or Andarri tell you that Silver-Claw is looking for you, he can be found at the Den's Library, agitatedly pacing back and forth. Velsa: "Silver-Claw, stop pacing! You'll wear a rut in the floor." Silver-Claw: "It helps me think! Now, where is the guildmaster? Or acting guildmaster? Or whatever you call it?" Velsa: "Look who's here! Your long wait is over." "Silver-Claw is fidgety as a … well, as a cat. On hot sand. With a knot tied in his tail. He's got some information and he's anxious to share it with you." After talking with Silver-Claw, Quen and Walks-Softly will arrive. Quen: "You know where Zeira is? Are we going to rescue her?" Velsa: "What do you mean "we"? I'm retired." Quen: "Zeira would do the same for any of us. Even you, Velsa." Walks-Softly: "The least we can do is hear out our acting guildmaster. So what is the plan?" You will now have to convince Velsa to help rescue Zeira. "I know that look. That's your "tell Velsa to do something" look. Why do none of you believe I'm retired? I could say it slowly. "Ree. Tired." Did it stick this time?" We need to recover Zeira from No Shira Citadel. "I only traveled to al-Danobia Tomb because I had history with the people who died there. But poking around the Iron Wheel's headquarters? Lunacy. I need a phenomenal reason to risk my life for Zeira's." "You did, and I am grateful. But rescuing Zeira is a tall order. I'll do so, on one condition. Promise to help Narahni, should she ever need it. I want her final years to be without the pain she suffered in the time that came before." I promise. Now, about No Shira Citadel …. "I'm going to smash some stink apples at the front gate to draw the Iron Wheel there. The distraction will make it easier for you to get in elsewhere. What? You're temporary Zeira. You think I ever let her tell me what to do?" When you arrive at the Citadel, Velsa will have already caused her distraction. She will appear once you and Walks-Softly have gotten inside. Velsa: "My distractions worked, as expected. I'll stick to the shadows for now." Velsa will then walk up the path and disappear. While in the Iron Wheel Headquarters, you will come across Nicolas in his cell, Velsa and the others will appear once you start talking with him. Nicholas: "Ah, Walks-Softly. So good to see you again. How have you been?" Walks-Softly: "Hunted. Missing too many friends." Nicholas: "And Velsa as well? I thought you'd retired!" Velsa: "And I thought you were dead. Seems we were both disappointed." Nicolas: "And … who are you? I don't believe we've met." Quen: "I'm someone who knows better than you listen to your lies." You have the choice of giving Nicolas a lockpick and a chance to free himself in return for Zeira's location. You can ask Velsa for advice. "Nicolas wasn't lying. I figured out all of his tells long ago. He knows where they have Zeira, which means the acting guildmaster has a decision to make about a lockpick." What do you think? Should I give him a lockpick? "If Chief Inspector Rhanbiq personally moved Zeira, we have very little time. A single lockpick won't do us any harm, and it gets us what we need. And I'll know if he's lying. So yes, toss one his way. Aim for the eye." When you have found Zeira, the Chief Inspector will be there. While you talk to him, Velsa will sneak behind him. Chief Inspector Rhanbiq: "The other thief? Surrender, all of you! The Iron Wheel is relentless. We serve a higher calling than gold or riches." Velsa: "What? He seemed the type to talk all day." Quen: "You aren't the only prisoner we freed. They're on shore and itching to come back to the Thieves Guild." Velsa: "Yes, yes. A charming reunion. Open the cage so we can go." Once you have freed Zeira and spoken with her, she will give orders to the others. Zeira: "Quen, good work freeing the prisoners. There are a few more on this ship—break them out and send them topside." Zeira: "Good. We'll need them to strip this vessel and the docks of whatever they can carry. Velsa?" Velsa: "Don't bark orders at me. I'll set trap near the prison door. Slow down any Iron Wheel come to check on the ship." Zeira: "Everyone, be quick about your work. Don't linger or we'll end up back in a cell." Zeira: "Once you have all you can carry, grab a boat and row hard for Abah's Landing. Let's go!" When you have found a rowboat you can meet them all back at the Den. If you talk with Velsa she will remark that you are not incompetent. "All right. I'll admit it. You may … provisionally, mind you … be somewhat competent. But don't let it go to your head." After you have spoken with Zeira, the guildmaster will have things to say. Zeira: "As for the rest of you—I'm naming you as part of my Thieves Council. I'll need those I can trust in the coming months. Yes, even Velsa. "Councilor emeritus," if it suits you." Walks-Softly: "This calls for a drink. Or five. Where's Andarri?" Quen: "Don't be so … well, you." Someone else will then arrive. Malizah: "My apologies for interrupting. Your … "Lord Thrag" escorted me here?" Malizah: "Magnifica Falorah requests Zeira call upon her at the earliest convenience." Zeira: "I'll have to celebrate later. Opportunity waits for none of us, whatever title we have." Velsa: "What would you have us do? Stare at one another until your return." Quen: "What does it matter to you? Aren't you retired?" Velsa: "Semi-retired. And what would you suggest? Hold hands and sing songs?" Quen: "Hardly. The only tune you know is "grating." Velsa: "(Laughs)I think I'm starting to like you." If you speak with Velsa afterwards, she will be smug, "I'll enjoy holding this over Zeira's head for the rest of her life." 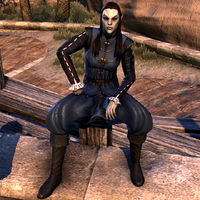 After receiving a note from Velsa about Narahni, you can find Velsa with Narahni near the dried-up flower bed in the Den. "I see you found my latest note. Thank you for responding so quickly. Go, speak with Narahni. She specifically asked me to contact you after she received a letter from Faradan. It clearly upset her, but she refuses to say anything to me." Once you have spoken with Narahni and learnt about her son, Velsa will talk to her. Velsa: "Narahni, you should have told me. Of course I'll find your son!" Narahni: "Oh no! This one doesn't want to be left alone to worry about you and Tashmin. Please. Stay here with me." Velsa: "Of course. Our friend here is capable of finding Tashmin. Everything will be all right." When you bring Tashmin to Narahni, Velsa will be standing by. Tashmin: "Is that … my mother?" Tashmin: "This one never should have stayed away so long." Narahni: "Oh, happiness, oh, joy! First Velsa and now my Tashmin." Velsa: "Your mother has missed you. Welcome to our home, Tashmin." Narahni: "We have so much to catch up pm, my dear, sweet son. Come, let us talk." While Narahni and Tashmin catch up, you can talk to Velsa. "What? I must have something in my eye. Mold spore or something. It's this damn cistern! Who lives in a cistern? I can't wait to get back to my garden." Narahni and Tashmin seem happy to see each other again. "It certainly looks that way. Between Tashmin and I, Narahni had a hard life. I just want her to be happy." Now she has you both back in her life. "And I plan to make up for everything Narahni has missed. I'll be there for as long as she'll have me. I can't change the past, but I'll do my best to make her future better." Are you all right sharing Narahni with Tashmin? Tashmin is … he's part of this family. And it's a better family than the one I was born into, believe me." If you talk to her again she will remark on how well Narahni is fitting in. "I'm surprised at how well Narahni has taken to life in the Den. She's treating it like another adventure. Half the rogues that pass through here come by to talk or have a piece of one of her pies. She's the kindest soul I know." After you have completed The Long Game, Velsa can sometimes be found in the main chamber of the Thieves Den. "You know, I think Zeira has some potential as a guildmaster—but don't tell her I said anything of the sort." Were you enjoying your retirement? "What? Are you writing a book? Go bother someone who isn't likely to slip poison into your waterskin. All right. If you must know, yes. I love the quiet, working in my garden. Still, I suppose a part of me missed this life. A small part, but …." What do you think about Quen? "She's too young, too inexperienced. I don't know what Zeira was thinking, allowing that youngling to join the guild. Oh, she's got some raw talent, I'll give you that. But raw talent usually just winds up turning a sweet heist sour, mark my words." What do you think about Walks-Softly? "Never quite understood that preening, over-dressed lizard, but he's good to have around. He's too happy for his own good, mind you, and talking to him makes my head hurt. Still, the guild is probably better off with him than without him. I suppose." I can't wait to hear your thoughts about Zeira. "I go away and come back to find that Zeira's in charge? Ha! She's got delusions of grandeur, but she's far from ready to lead this crew. Besides, I was never keen on taking orders, even back when Nicolas was the guildmaster. Not about to start now." You can also witness her conversations with the other guild members. Velsa: "No excuses. My things are off-limits. If you touch them, I'll know." Quen: "Why would I touch your things?" Velsa: "You're a thief in the Thieves Guild. Why indeed?" Velsa: "Stay out of my things!" Zeira: "Stop blaming Quen. Thieves don't steal from each other. You must have misplaced it—look again." Quen: "What's her problem? I didn't touch anything. Wait … it was you? No. You didn't!" Zeira: "She commandeered my quarters. They are still technically mine. Don't tell her, all right?" Quen: "Not for all the gold in Tamriel." Velsa: "Two. Two sprigs of thistle!" Quen: "Wha—I, sorry, two sprigs—and then? I can't breathe. Velsa!" Velsa: "That's just panic. You're fine until your tongue starts swelling." Quen: "Can I please have the antidote, I'll never touff—oh, my. Velfa. Velfa!" Velsa: "I'm sorry, who's that?" Quen: "I keep hearing about the dowry heist, but nobody can share the details. How exactly did it fail?" Velsa: "Zeira was the only survivor. Yet she avoids answering that very question. I find that curious." Walks-Softly: "She lost friends, Velsa. That pain can linger." Velsa: "Everyone lost friends. And she's the guildmaster. She can't hide behind that." Walks-Softly: "No. But she carries the loss with her. And she will, until the day she dies." Walks-Softly: "The other day, I passed Silver-Claw on the street. He made a strange motion with his hand." Quen: "He did the same thing to me. What do you suppose it meant?" Velsa: "I convinced him we have a "thief salute."" Walks-Softly: "I thought it was an obscene gesture, so I returned one of my own. I should stop by his shop and apologize." Walks-Softly: "This is pointless. Most of the Iron Wheel have already returned to Taneth." Velsa: "Which means there are less of them around to guard their pay." Walks-Softly: "Velsa, think. If we empty their coffers completely, they can't buy passage by ship. How will they ever leave Hew's Bane?" Quen: "We leave them just enough to purchase camels?" Walks-Softly: "That could work. All right, Velsa—go over your plan once more …." Velsa: "I rescued you from the Iron Wheel. You will always owe me, Zeira." Zeira: "I know Velsa. I can't thank you enough." Velsa: "You … you what?" Zeira: "I said, "thank you." And I'll say it for the rest of your life." Velsa: "I don't know what your game is, but … stop that. It's unsettling." Velsa: "Zeira has been too happy, lately. I don't trust it." Quen: "We rescued her from the Iron Wheel. Of course she's happy." Walks-Softly: "I think Velsa is more concerned that her barbs no longer stick in Zeira's hide." Quen: "You're right, now that I think of it. It doesn't matter what Velsa says, she's just … placid." Velsa: "It won't last. It can't last, can it?" Velsa: "You're evading. Why did you send your protege halfway across Tamriel?" Walks-Softly: "She doesn't want to speak of it, Velsa. Leave her be." Zeira: "I sent my "protege" to deal with Nicolas. He will no longer trouble the Thieves Guild." Velsa: "Oh. Well … this calls for some wine, don't you think?" Velsa is voiced by Debra Wilson (IMDb). This page was last modified on 18 February 2019, at 15:36.